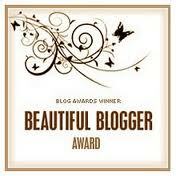 I want to extend my big thank yous to Genie for nominating me for the Beautiful Blogger award. I’m a total novice when it comes to receiving awards (although I did practice my acceptance speech for an Oscar many times when I was a kid), so I am going to be quite dutiful in fulfilling the requirements for this award. GenieSpeaks at WordPress is a love-filled, candid blog written with Genie’s incredibly generous spirit. I admire her faith, optimism and ability to see the wonder in the smallest of moments. Thank you again Genie! I now have the pleasure of nominating seven others – and it is hard to select just seven, considering how many people’s work I admire…May I say – this is really hard. With that caveat, here goes..
That’s eight – I’m sorry! But tis better to err on the side of generosity than miserliness, right? I have to include the following blogs, because I really love them too: supertucksmama, This Man’s Journey, Practical Practice Management, and manipal’s blog. I’m not sure if all of these will directly link up – they are all on WordPress and they are all worthy of a visit from you. Thank you to Genie again!! Enjoy your weekend everyone! OH!! I forgot – you wonderful nominees – please copy and paste the award onto your post, name the person who nominated you (c’est moi) and pay it forward by nominating seven other bloggers…oops! Posted on May 19, 2012 by mimijk •	This entry was posted in friendship, inspiration, life lessons and tagged awards, paying it forward, WordPress. Bookmark the permalink. Well deserved mimi…and thank you for thinking of me. You are so welcome!! You deserve it! You reap what you sow, my beautiful friend. You reap what you sow!! Kudos to you. Standing in the airport doing the “happy dance”. Congratulations! I always look forward to what you have to say, and you always say it so well! You are most deserving of the nomination. Congratulations Mimi, how wonderful! And thank you so much for mentioning my blog, I am very honored. I think your blog is terrific! Thank you that really means a lot to me, as you know we invest a lot of time and thought in our blogs and it brings us joy and satisfaction when others enjoy our efforts. I feel the same way about your blog also. CONGRATS Mimi, and THANK YOU for nominating my blog! I am truly humbled to be in the company of so many I admire! I’m a neophyte in the blog world and have learned so much from following you, David and others. You alternately inspire, challenge, educate and amuse me in some form or fashion every day, and for that I am most grateful. Happy Sunday! My pleasure! I think your writing is terrific and it was as much fun to be able to honor those I respect as it was to receive the award! Thank you for your very kind words. I’m just sitting here blushing and grinning. It’s all true, Genie..glad it made you smile! Sorry, I am late to the party. First, thank you for the nomination. I have very much enjoyed our exchanges on both your site and my site. My world would be a darker place if not for your little ray of sunshine each day, so I would be in full agreement that you are deserving of the award. I will make time today to visit each of the blogs that you have listed and check them out as I find your taste impeccable. Thanks again and sorry I am just now reading this. You’re welcome! Not sure all those blogs will be your cup of tea..happy to think that i bring you some sunshine when i post!